Combining the unique square wheel display with a retrograde date for a playful new ML Masterpiece. If you prefer the anatomy of a watch to be front and centre, a skeletonized movement and dial are the way to go. There’s a middle ground, however, for those who want a bit of mechanical action without the mechanics on full display. 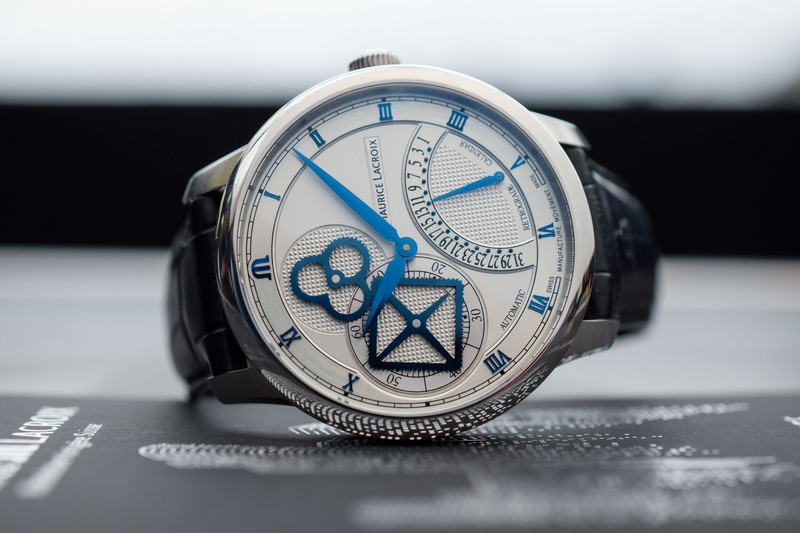 In this perspective, Maurice Lacroix recently added another Masterpiece to its collection with a unique take on this mechanical middle ground. Based on the cool unique Square Wheel display invented by ML a few years ago, the brand adds now a signature retrograde date and, best of all, a more accessible price. This new Masterpiece has a square wheel (roue carrée) coupled with a clover-shaped wheel to display the seconds, standing out with playful sophistication. Its previous Masterpiece Square Wheel watch showcased this square wheel set-up as well, but the new watch we have today on review adds a retrograde date display to combine both of the company’s signature features. 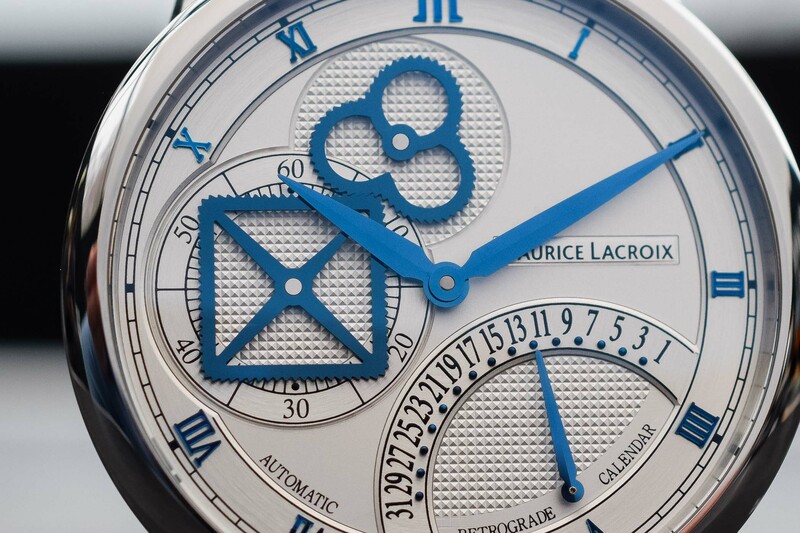 The unconventional aesthetic may be somewhat polarizing for some, but there’s no denying that Maurice Lacroix has created something special. Let’s take a closer look. The watch is on the large side with a 43mm stainless steel case (15mm in height), but it allows for an expansive view of the unique dial. 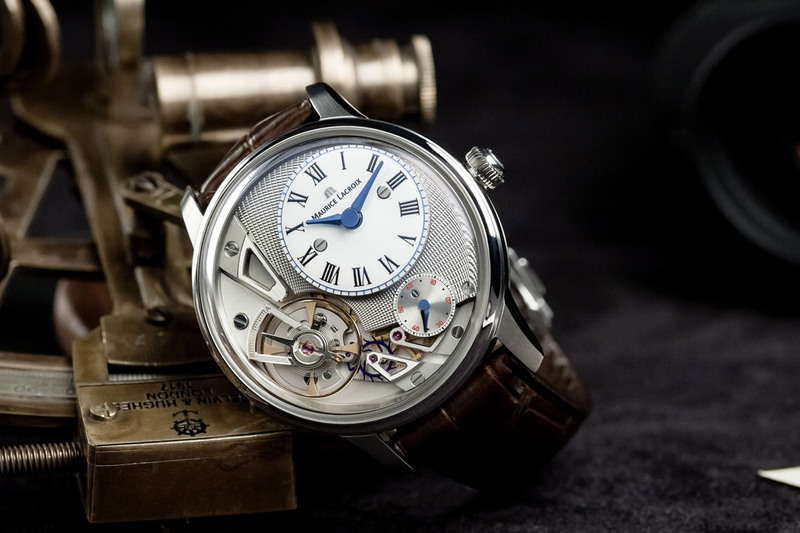 A sapphire crystal caseback displays its decorated automatic movement and the case is water-resistant to 100 metres. 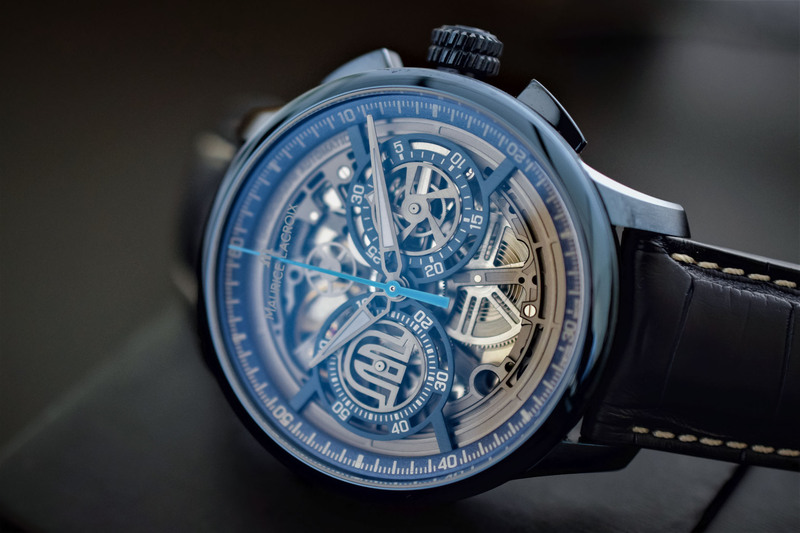 The watch also comes in two flavours, one with a silver dial and blue hands, indices and exposed gears, with the other sporting an anthracite dial with vertical Geneva stripes and gold accents replacing the blue. But let’s just cut to the chase – there’s a square gear perfectly meshing with a clover-shaped gear that displays the seconds on the dial, and that is quite special! 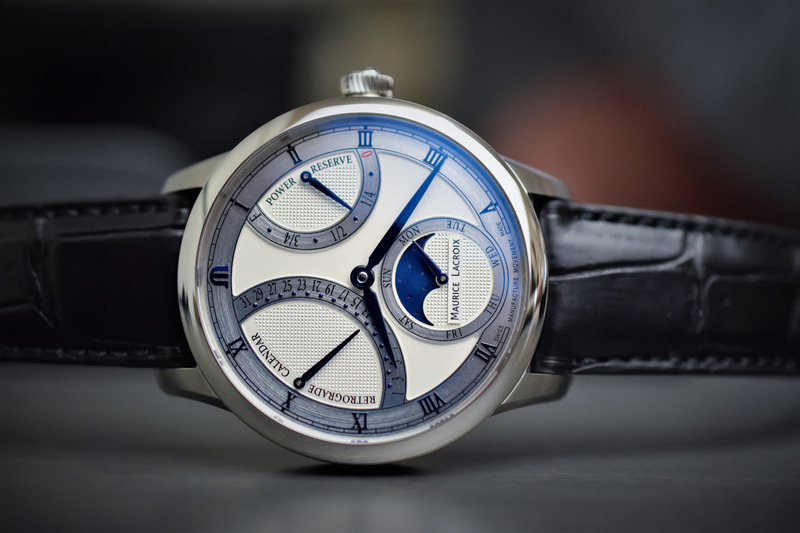 Maurice Lacroix pioneered this layout in 2010, however, this mechanism displayed the hours instead of seconds – as a regulator watch. In 2014, the brand took the same idea but adapted it to the seconds subdial, making it visually more striking, with the two gears in constant motion as the seconds tick by. The clover-shaped gear drives the square one within its 9 o’clock sub-dial, with printed Arabic numerals every ten seconds. The square wheel has four spokes, but one stops short of the corner to function as the seconds hand. The mechanism is art in motion. 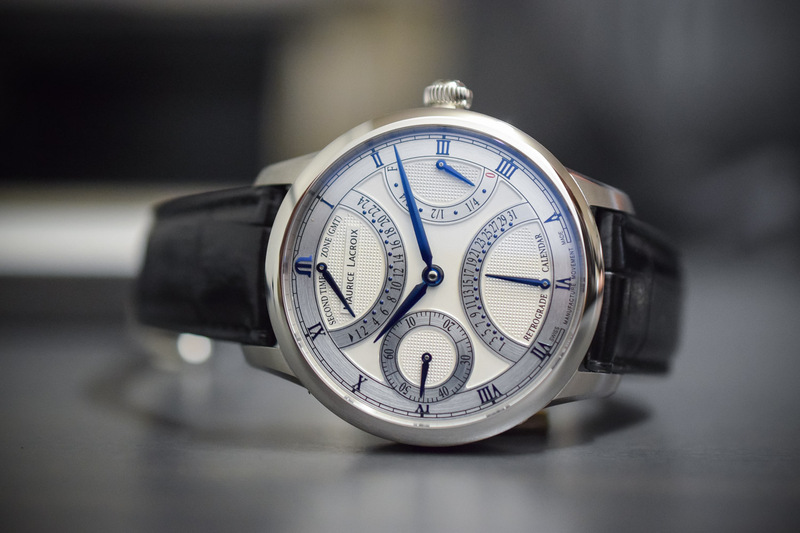 Maurice Lacroix also has an affinity for retrograde displays and previous Masterpiece watches have had calendar and/or dual-time indications in the format. 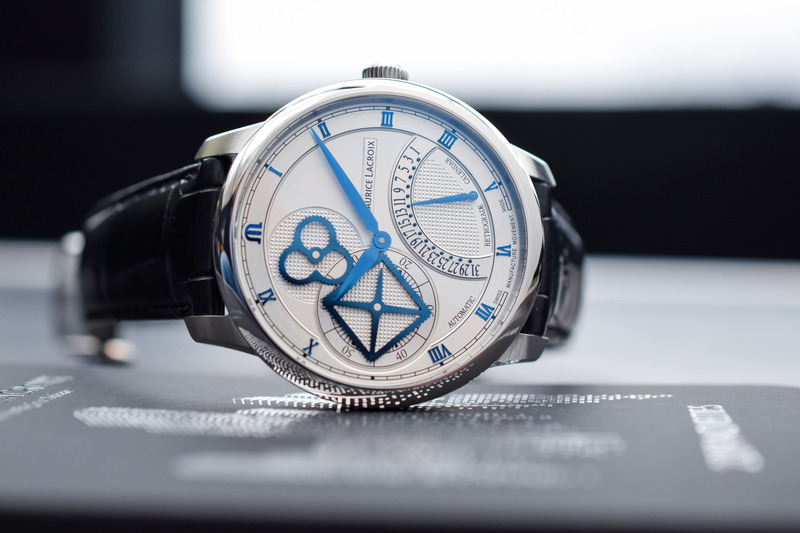 This is the first time, however, that both a square wheel and retrograde complication have shared a dial – with the retrograde hand displaying the date in this case. An arc of odd calendar numbers (1, 3, 5, etc.) starts at 4 o’clock and ends at 6 o’clock, and a hand inches down to indicate the date, jumping back to the top position every month. The silver dial has small blue dots marking the even days between the printed numerals, but not the anthracite dial, although there’s adequate space between them to accurately register the date. Previous Masterpiece Square Wheel watches had in-house movements but this new piece uses a Sellita SW200 automatic calibre with an in-house complication module. 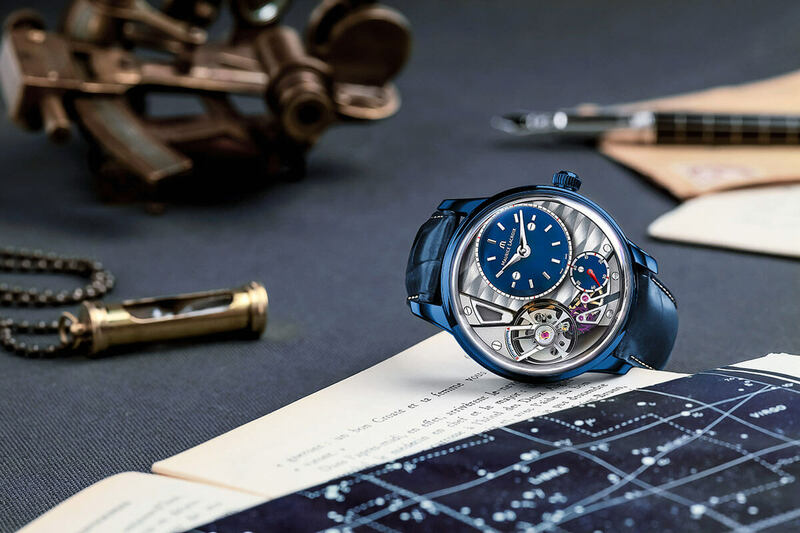 This allows the company to lower the price (30% less on the final price) while using a proven base under the module developed in Saignelégier, Switzerland at the Maurice Lacroix manufacture. The Manufacture ML258 calibre has 37 jewels, beats at 28,800vph (4Hz) with a 36-hour power reserve. The rotor is skeletonized and decorated with Côtes de Genève. Exposed parts are both rhodium-plated and sandblasted, and embellished well beyond the base SW200 finish. The Maurice Lacroix Masterpiece Square Wheel Retrograde 43mm retails for CHF 6,900 for both the silver/blue and anthracite/gold variants at participating retailers. 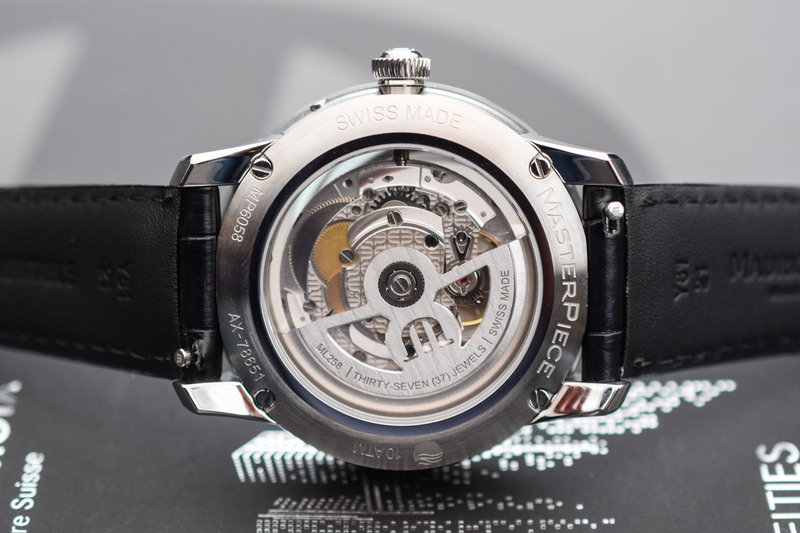 The previous version with an in-house movement was priced at CHF 9,900. 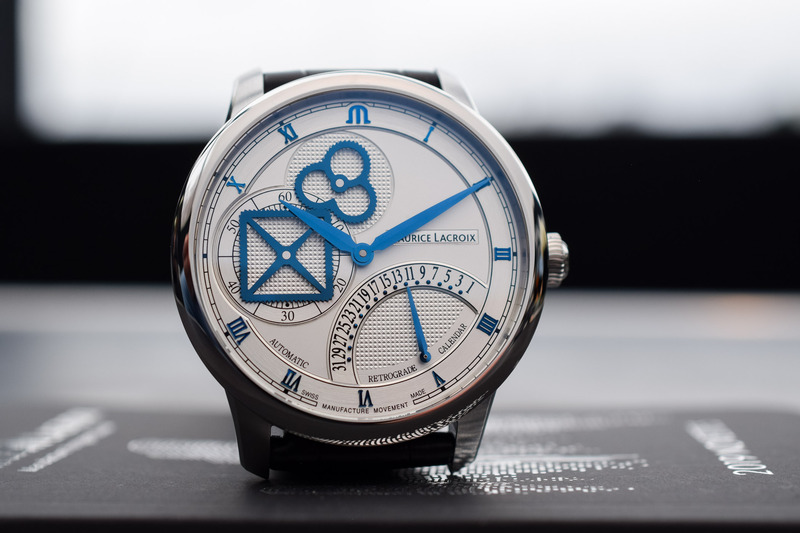 More information at the Maurice Lacroix website. I really can’t see the point of this. 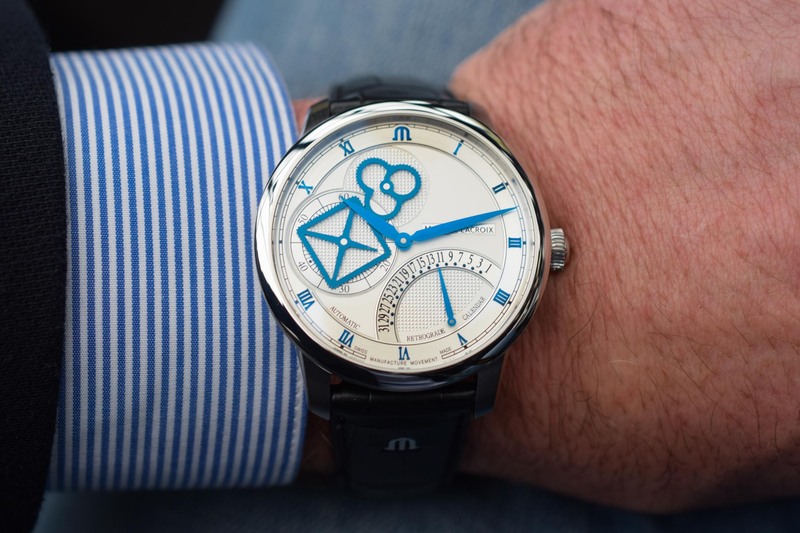 I really like the unique use of geometric shapes, but would have preferred the shapes and markers be done in black or silver steel, rather than blued like the hands, which makes the dial appear to be a bit of a mess. Also, I’ll never be able to wear a MC at 43mm and up anyway — so many of their designs would work just fine in a smaller case, but guess they don’t want to reach the middle and smaller wrist market. I like the blue, and while the novelty of the intersecting geometry’s is cool, I can see it eventually becoming distracting. Still, great price, wonderful finishing and slightly edgy in presentation. Too big for sure, but this piece is not really aimed at my older fuddy duddy demographic. This continued revelry in ignorance by a large proportion of the population really gets my goat. A dress watch at 43mm?!!!! The other day I watched an American TV show in which a man turned up at a funeral wearing jeans and an open denim shirt! A few years ago I was noodling around on a guitar at a party and a guest said, “Wow, I’d love to be able to play classical music.” I WAS PLAYING BLUES!! !